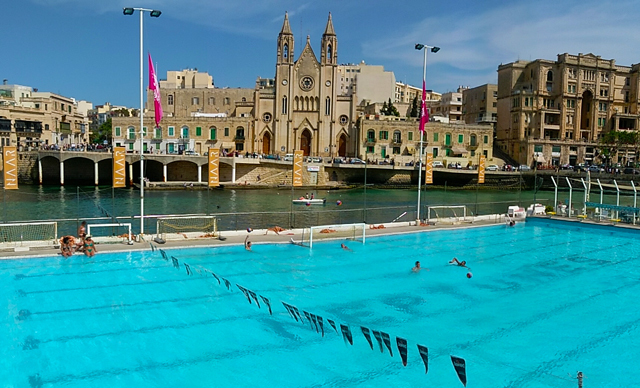 Neptunes are one of the leading waterpolo and swimming clubs in Malta, established in 1929. The club premises are situated in the picturesque Balluta Bay, St.Julian’s and offers facilities to swimmers and waterpolo players alike, that are the best available on the island. The fresh water pool, can be heated during the winter months and is 33.3 metres long and 22.5 metres wide. 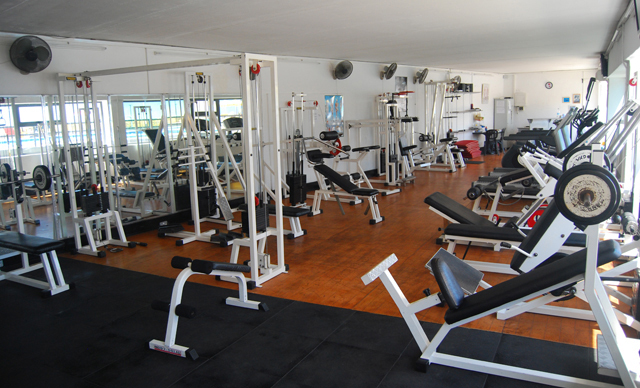 A fully equipped fitness centre,changing rooms and showers are also available on the premises. Should you be interested in organising a training camp for your waterpolo or swimming team, and making use of our facilities, please send an e-mail to info@neptuneswpsc.dev, and we will be pleased to provide you with details of our rates, which can include accomodation at one of the many hotels ranging from 3 to 5 star,located within walking distance from the club. During the summer months, with the waterpolo season in full swing, and the tourist season at its peak, Neptunes becomes a hive of activity, with members and guests having the facility to relax on the large sun deck area, and enjoy the best of both worlds with a swim in the pool or the clear waters of the sea surrounding the premises. Even diving enthusiasts are catered for, with a 5 star PADI certified diving centre operating from the club. A well stocked bar and a restaurant serving a large variety of snacks and dishes at reasonable prices are at the disposal of members and guests. 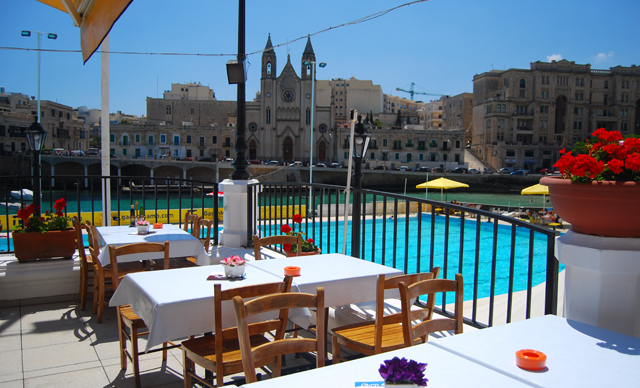 Paul’s Seabreeze is the bar & restaurant overlooking the Neptunes swimming pool with stunning views of Balluta Bay and the blue Mediterranean Sea, serving both lunches and dinners. The menu is varied and offers a wide selection of food throughout the day including pasta, meat, fresh fish as well as salads, home-made burgers and mouth-watering pizzas. During the summer months, the cafeteria and snack bar by the pool is also open during mornings and evenings throughout the week. For bookings call +356 21366169. The large fresh water swimming pool is at the centre of our facilities and measures 33 x 22 metres and is 1.9 metres deep. The pool is surrounded by a spacious sun deck and facilities include showers and changing rooms at no extra cost. The sun deck also has access to the sea for those who prefer to have a dip in the clear Mediterranean Sea surrounding our club. The pool is open daily between 9:00am and 5:00pm from April to October. Naar lets all of life’s pleasures come together – Entertainment, Dining, Music & Fashion all in one. 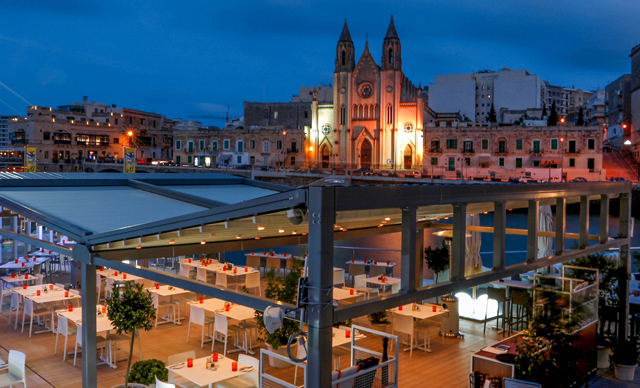 Set against the beautiful backdrop of Balluta Bay, NAAR has it all – a restaurant, bar, cocktail lounge, both indoor and outdoor seating, as well as a full-size outdoor pool. With our vibrant atmosphere, enjoy a selection of grilled meat, fresh fish, exquisite pasta, crunchy pizza & healthy salads, as well as a large selection of signature drinks. Throughout the day you may enjoy Breakfast, Lunch, and Dinner, or stick around for them all. Whether it’s after a day at work, a leisurely Sunday, or you’re celebrating a special occasion, life is better chilling at NAAR. For bookings call +356 21373412. For rates further information do not hesitate to contact us on 99896790 or nlanzon@onvol.net. We are a fully accredited FIVE STAR Dive Centre and Diving School affiliated to PADI’s International Resorts and Retailer’s Association Number S-26519. We are licensed by The Malta Tourism Authority License number DIVE006 to carry out the functions of a scuba diving school and e-learning centre. Our Instructors are highly trained and motivated individuals in current teaching status. When you combine all our Instructor’s years diving we have a total of over 90 years diving experience among us all! We are a people business and recognise the true worth of our clients . Our customer care and service and your safety is paramount and close to our hearts. We strive to give our maximum in product and quality satisfaction so you can have a valuable experience and an unforgettable one when you dive with us! For further information, please visit www.conceptscubamalta.com.